Why do they always say, “Set phasers to stun” when arming up for an away mission? Is there some reason for this constant admonishment to set phasers to the stun setting? Aren't all phasers calibrated to that default setting and have to be manually adjusted to a higher setting? I can understand a 'weapons check' but that is a different function altogether and is typically done by the armorer and demonstrated by the recipient when drawing the weapon, not waiting until they're standing on the transporter pad seconds before beam-down. This seems a bit late for such a function. So is there some other meaning or rationale to proclaiming, "Set phasers to stun"? Because Starfleet is a peaceful armada / military force, they try to go into as many situations as possible with non-lethal intentions. 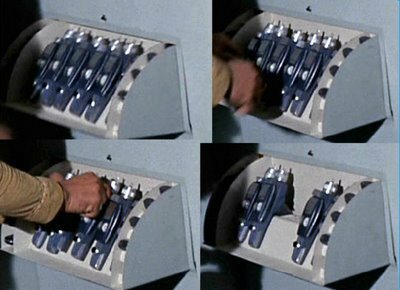 Phasers are typically stored in lockers (either in the armory or near the transporter pads) and are not personal. This means when you pick up a phaser it might be set to whatever setting it was last used on. Saying "set phasers to stun" is like modern police or military says "check the safety on your weapon." It is a precautionary command to make sure everyone starts at the same level of intent. They set phasers to stun, because it's like saying check your gun and make sure you have the safety off or on. They don't want to attack and cause more damage than they are suppose to until the situation is clearly against them. Also, if someone friendly fires and the phaser is set at stun, the most that will happen is that the person will lose a couple of brain cells. I don't know if phasers have a off button, but if they do they are probably saying make sure your gun is ready to go, make sure it is on. 11. "SET PHASERS TO STUN" It was established early on in Star Trek: The Original Series that the phasers used by the > crew of USS Enterprise had a “stun” setting (as mentioned in “The Man Trap” episode), and both Kirk and Spock often found themselves instructing their crewmates to use the non-lethal capabilities of their standard-issue weapons. However, it wasn't until the second season of Star Trek: The Animated Series that we first heard Kirk issue the command “Set phasers to stun.” The line eventually became an oft-repeated order in subsequent series, turning up in both Star Trek: Deep Space Nine and Star Trek: The Next Generation, as well as many of the movies (including 2009's reboot). Also, stun probably was the main setting. Why would Starfleet have their main setting anything higher, they are suppose to help, protect and do as little damage as possible.Telling people to set their guns at stuns, is also like saying make sure the situation needs higher force before you used the kill setting. And it might have been like someone saying "get your head in the game". You don't know the situation. The place you go into might have kids or someone else very innocent. And you can still hurt them from the stun. People writing sci-fi series like Star Trek where there is that casual audience to consider often have to assume that the person watching the episode may be uncaring enough to not bother watching the whole series/from the beginning so they have to accomodate for the lowest common denominator. This is why you often get people stating ridiculously obvious things (i.e imagine the main character's brother is introduced in episode 3 and then turns up again in episode 6, the fact the characters are brothers must therefore be mentioned at least two or three times in episode 6 for the sake of the people who didn't bother to watch episode 3). In this case, the writers of Star Trek had the awful task of reminding the parents "It's ok, nobody is being killed here". If it weren't for that line (and bearing in mind the era Star Trek first aired in) imagine how many parents would have stopped their kids watching it or written in to complain that it was too violent because the 'bad guys' were being killed. It's like when you plan to go on a big trip, and you always go to the toilet before you leave so that you don't have to go half way through the journey. In this case, they check at the last minute to be absolutely sure. If they land in a hostile area and start firing, and only then does someone realise their phaser is set to kill, that someone could be 'fired' (or the equivalent, probably 'decommissioned') or even face legal action. So to prevent legal action, they always make a final check before leaving, no matter how many checks they made prior. At least then if the phaser had a faulty mechanism or something they could cover their asses. Pulling from real world experience, before military personnel begin a action, they often go through a checklist to verify preparation (see also: pilots pre-flight). A review of rules of engagement, objectives, tasks and timing to assigned to individuals is also standard. Set phasers on stun, in my interpretation, is the short hand for 'we've been through the briefing, now lets go do this'. Also, (again from the real world) you always assume a gun is loaded and the safety is off until otherwise verified. In a sense, this is can be viewed as the same as 'safe your weapons'. "like nothing we've ever seen before"
Short answer: Chain of command. This procedure ensures that everyone has an explicit order from the person leading the away team regarding the phasers. This way, no one can be blamed afterwards for using an inappropriate setting, because everyone had orders to use this setting and only this setting. The mission fails because the bad guy was only stunned and escaped later? "I can not be blamed, I had my order." Someone from the away team kills someone with his phasers? Now he can not excuse this with "I was not ordered not to use the kill setting. I assumed we were to defend ourselves by any means necessary." So this both acts as a reminder and as an explicit order for which there may not be time later, when in actual conflict. I tend to agree with the turned "OFF" situation. When placed in the holder, surely they are being charged. If not off, then maybe a "Stand By" mode where it actually does not have use any power and then must be switch to other settings when directed by the away team lead. And, I also agree that in directing everyone to use the same setting, you reduce liability. And yes, everyone in military or law enforcement or just anyone carrying a weapon does know that the level of force can be changed depending on life threatening situations. But they always must have a standard order for what setting to start with so all are on the same page. Away teams are formed Ad-Hoc and are intended to present the minimum personnel required to evaluate a situation. Because there are no default away team configurations, human error exists, and Starfleet crew members rarely use phasers (they dont even have a practice range,) and members of a previous away team may have encountered hostile enemy contact, it is safer to ensure that all team members have their phasers set to the lowest setting and everyone can escalate if present hostilities demand. Not the answer you're looking for? Browse other questions tagged star-trek star-trek-tng or ask your own question. Is there a canon explanation for why Star Trek away teams don't wear environmental suits? In Star Trek TNG, why don't they always go at warp 9? Episode ID: When did Spock say “To destroy your home planet's ecosystem for…” (did he ever)? Why didn't they just transport Tosk out, why did they wait for him to be released? Why do ships appear to stretch when they jump to warp? When and why did policies concerning captains and away teams change? Why can't they have the transporters alter appearance on away missions? Why do the Starfleet vessels always get cold so quickly when the power goes out? Why Do Starships Bank When They Turn? When and why does an away-team member wear native clothing during negotiation?